SUBHEAD: We cannot rely on our governments to tell us the truth about the dangers we face from continuing our current existence. 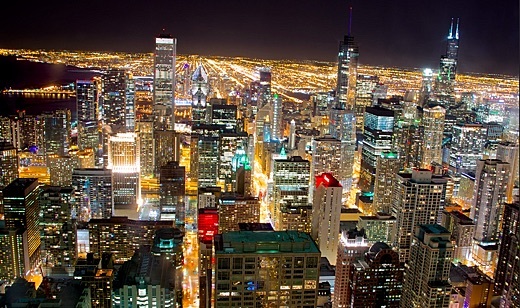 Image above: A shot at night of Chicago from the John Hancock Building looking south. Photo by Jamie of Bytown. From (http://www.wired.com/2014/12/cities-climate-change-danger-warns-capitan-planet/). Two articles came to my attention this morning. The subject of these pieces are cover-ups of ongoing disasters that may cause TEOTWAWKI, or the End Of The World As We Know it. Both are related to the ways in which we get the energy to meet the modern world's day to day needs. The first cover-up goes back to the 1970's and has continued for 40 years. It is that Exxon Corporation has been doing Climate Change science related to CO2 emissions all that time and has known that the rate of burning petroleum products would threaten our very existence. In the intervening years Exxon chose to become Climate Change denier and amass more profits than any other company during that period. For decades, Exxon has publicly questioned the science of global warming, contradicting internal findings by the company’s own scientists. Recent exposés by InsideClimate News and the Los Angeles Times reveal that Exxon concealed for decades its own conclusions that fossil fuels cause global warming, alter the climate and melt the Arctic. Exxon’s climate deception is now sparking calls for a federal probe similar to that which yielded a racketeering conviction of Big Tobacco for hiding the dangers of smoking. We are joined by Rep. Ted Lieu (D-California), who is calling for a Justice Department investigation of Exxon, as well as 350.org co-founder Bill McKibben, who was just arrested for a one-man protest shutting down his local Exxon gas station. "It’s difficult to think of a company that could have set back humanity for decades, and perhaps permanently," Rep. Lieu says. "But that’s what happened here." Video above: Interview on subject of Exxon cover-up with 350.org founder Bill MCKibbon and US Congressman Ted Lieu. From (http://www.democracynow.org/2015/10/21/prison_for_exxon_execs_calls_grow). The second cover-up has been on going for five years, ever since the multiple nuclear reactor meltdowns in Fukushima. It has been the policy of the Japanese and American governments to pretend the disaster is behind us and no major threat. They, and the corporations that depend on the economy supported by nuclear power (including mass media), have denied, under reported and hidden the evidence of the ongoing and increasing threat to life on Earth posed by nuclear energy and Fukushima in particular. Below is are excerpts from ENEnews.com made by former US Congresswoman Cynthia McKinney on cover-up of dangers posed by Fukushima meltdowns. "The elephant in the room is Fukushima radiation"
The media provide coverage of marine anomalies mentioning global warming, even El Nino and toxic algae, while the elephant in the room is Fukushima radiation. It is this silence that is deafening!… I do want to know why in the face of what appear to be Pacific Ocean die-offs, El Nino is mentioned and not the Fukushima-related elevated levels of radiation. Video above: The Fukushima cover-up begins. President Obama statement a few days after the disastrous meltdowns indicating that now harm should be expected in the Pacific islands, Hawaii, Alaska, or the continental United States. From (https://youtu.be/095dqQn_3H8). One thing we at IslandBreath have concluded is that now we cannot rely on our governments to tell us the truth about the dangers we face from on going poisoning of the planet by Fukushima radiation or the on going use of fossil fuels to continue our current existence. We must awake from the deep sleep of comfy coach potatoes, turn off the mass media and shutdown power generators and refineries that are killing the planet. Why a Speed Limit on the Internet?